As of Oct. 4, 2017 the Optional Field Trip registration is at capacity and CLOSED to further registrations. 8:00 – 4:00 Field tour with stops hosted by Oregon State University, Oregon Department of Forestry, and Starker Forests. 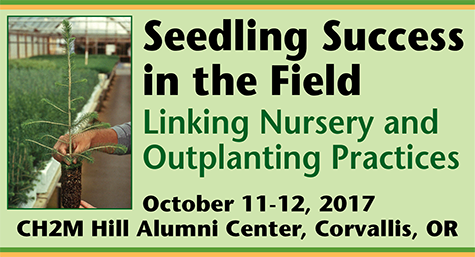 Stops will focus on established field trials for evaluation of short- and long-term nursery and site-prep effects on seedling growth and survival. See top right-hand column for field tour schedule. The conference will be held at the CH2M Hill Alumni Center on the Oregon State University campus, Corvallis, OR. The Center is at 725 SW 26th St. The meeting site is across the street from the Reser Stadium on the OSU campus and parking is available by the stadium. The cost of parking is $10/day, payable at the kiosk of b/c lots or the parking garage south of Reser Stadium the day of the event or payable online in advance. For additional information (including hourly rates) or to purchase a daily parking permit online please click here.